Thank you so much to Anabhra Tyagi from Wayward Array of Thoughts for nominating me for the Liebster Award. Do check out Wayward Array of Thoughts as Anabhra shares her thoughts through her life experiences on her wonderful blog. The Liebster award is a fun way of getting to know fellow new bloggers out there and help each other ease our way into the blogging world. Nominate 11 other bloggers (with under 200 followers). What is the one place you want to visit more than anything? Sri Lanka. My parents were both born there and I still have family there, so I am eager to go. With whom are you closest to in your family? Definitely my two sisters. They are not only my sisters but my best friends. I couldn’t imagine life without them. What do you do on a day when you have no work or any prior engagements? Well, at the moment it is blogging. I’ve just started this venture so it’s pretty time-consuming at the moment. Are you more of a party person or a stay at home watch Netflix kind of person? Which would you choose: Harry Potter or Twilight? Any book and music recommendations? What do you plan on achieving in this life? Definitely a dog person. I have never owned a cat. If you could go back in time and change something, what will you change and why? Do you have a message for the world? If yes then what is it? Have you eaten any delicacies (eg. snails) and what was it? Your favourite book, if you read. Have you ever been to Melbourne, Australia? Do give it a go and keep the chain going, I really enjoyed participating and I hope you will too. And I would love to read all the answers so please do inform me in the comment section. 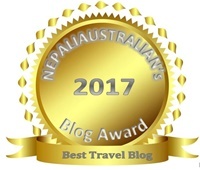 If you have completed a Liebster Award blog post in the past, share it with me in the comment section below. I would love to know more about you through your answers. Love your book recommendations. Have read most of those of Khaled Hosseini but will definitely check the others out.